Note: the ragout has to cool off completely, for the best result let it rest in the refrigerator overnight. First you’re going to make a roux. A roux is a mixture of butter and flour, it is used as a thickening agent. Melt the butter in a saucepan, stir in the flour and cook it for a few minutes. Keep in mind the roux shouldn’t become brown. Let it cool off completely. Stir the fish stock and milk together and heat it on medium high heat. Fill a small bowl with cold water, place the gelatin leaves one by one into the water and let it become soft within a few minutes. Meanwhile stir the fish stock and milk mixture little by little into the roux, keep on whisking to prevent it from creating lumps. Let it cook for a few minutes on low heat, keep on gently stirring to prevent it from burning. The ragout will look sort of shiny when it’s fully cooked and the flour taste will disappear. Squeeze the water out of the gelatin leaves and mix them into the ragout. Mix the yolks and cream until it’s smooth. Stir the mix into the ragout and season with lemon juice, pepper, salt and cayenne pepper. 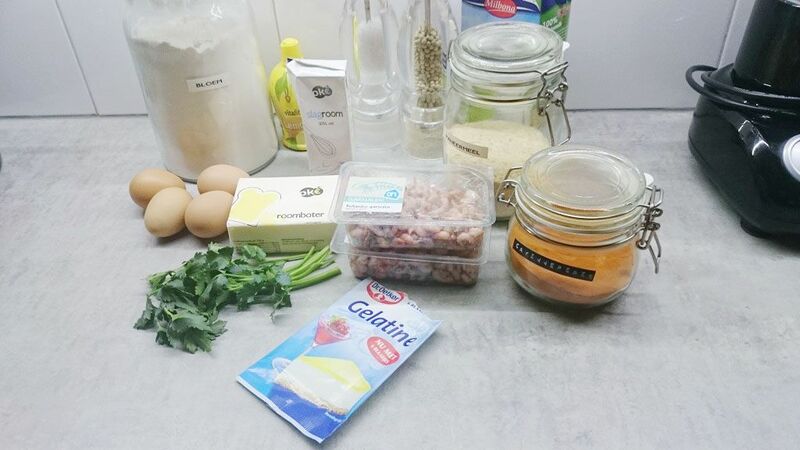 Stir in the dutch shrimps, or the larger ones cut into pieces. Finely chop the parsley and stir those in the ragout as well. Transfer the ragout to an air tight container and let it cool off completely. For the best result let it rest in the refrigerator overnight. Combine the egg whites and 1 tbsp of flour in a bowl and mix them until smooth. For a thick layer of crust on the croquettes, first sieve the breadcrumbs so you will only have the fine stuff left. Divide the fine breadcrumbs from the larger ones. On your work surface or large cutting board, place a thick layer of the fine bread crumbs and another with the coarse breadcrumbs. 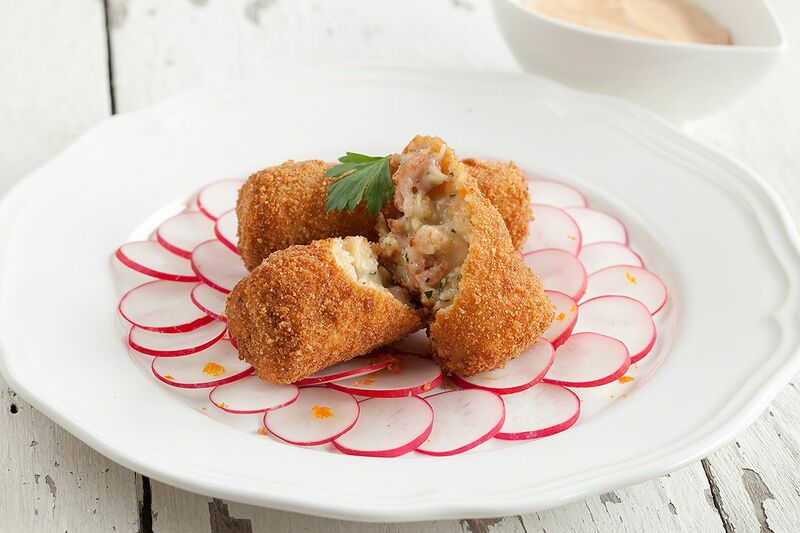 Roll the ragout with your hands until it looks like a croquette, you can make them any size you like. Roll them into the egg whites, keep in mind they shouldn’t be too wet. After that you roll them into the fine breadcrumbs and after that into the coarse breadcrumbs. The ragout needs to be covered completely, so check if every small spot is coated. If not, the ragout will run out during frying. Heat your frying pan to about 180 degrees celsius or 350 degrees fahrenheit and fry the croquettes until they are golden brown. That will take only 3 to 4 minutes, or until golden brown. Serve as a snack with an easy home-made cocktail sauce. You’ll need some mayonnaise, ketchup, vieux or whisky, paprika powder, salt and pepper. Stir it all together and there you have it! Or serve it as a starter with some radishes drizzled with orange juice and orange zest. Very delight combination that’s definitely worth the try. 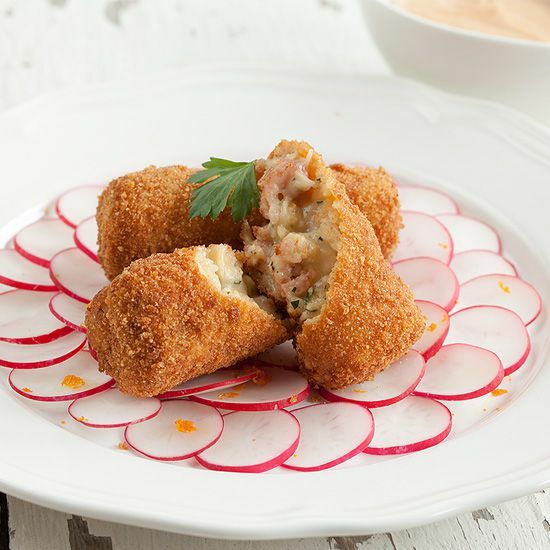 Cover a plate with cling film and place the croquettes individually on a plate and again cover with cling film. This way you can freeze them up to two months. 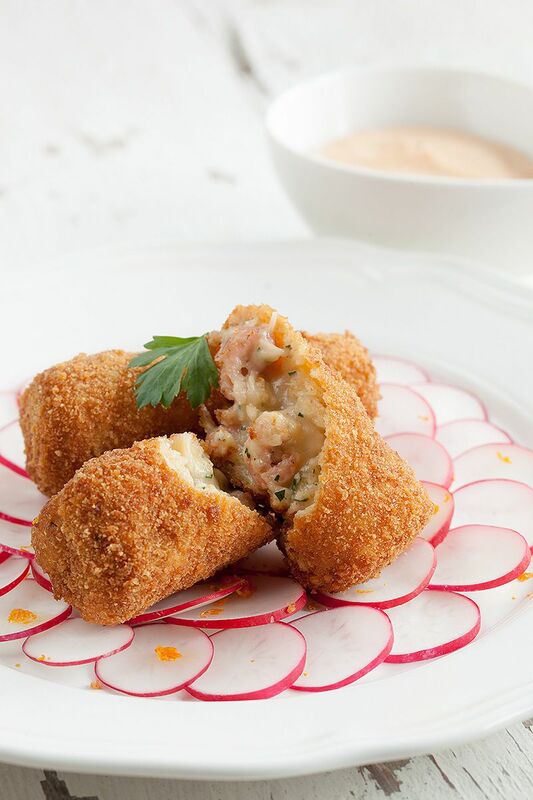 These look so creamy and delicious on the inside, and love that crisp outer layer – plus shrimp! Everything is better with shrimp! YUM!